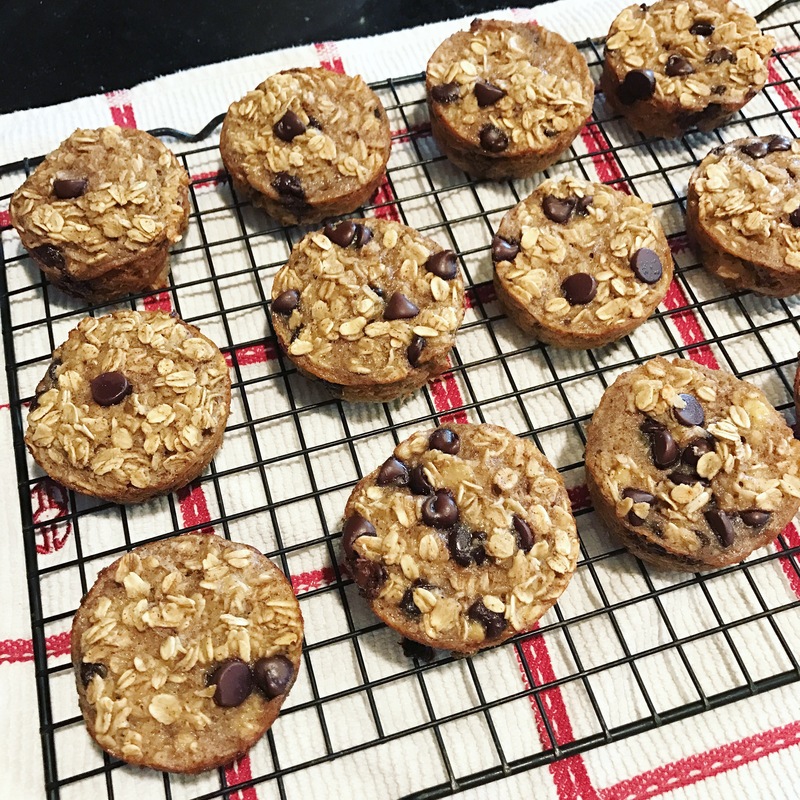 Flourless Oatmeal Banana Chocolate Chip Breakfast Muffins is what I called these on Instagram and what they really should be called. But holy mouth full! These are really good and great for a fast, healthy breakfast on the go for the whole family. However, I typically do not enjoy baking without flour. Or eating baked goods without flour. I like my gluten! BUT, to please my husband I made these… now I just have to see if my son will eat them! The recipe below can easily be doubled to make 24 muffins. But a dozen is perfect for my little family of 3 🙂 Go start your ovens and lets bake! Note: I used regular sized chocolate chips but if I make these again will use mini. It’s a pretty thin batter so some chocolate chips fell to the bottom and got stuck to the pan. Preheat oven to 350 degrees fahrenheit. In a large bowl, mash bananas with a fork. Add egg, milk and brown sugar and whisk until combined. Add baking powder, vanilla and cinnamon and whisk until combined. Stir in oats and chocolate chips. Pour batter evenly into prepared cupcake tin. Bake for 22-26 minutes. Allow to cool slightly before taking out of pan. Store covered for a couple days. Enjoy!